Think Ink isn’t just a stress ball that you picked up at a career fair or the Rubik's Cube you wish you could be playing with during your meeting. Think Ink is a focus tool with a writing utensil embedded inside to help you jot down your best ideas and get + done! 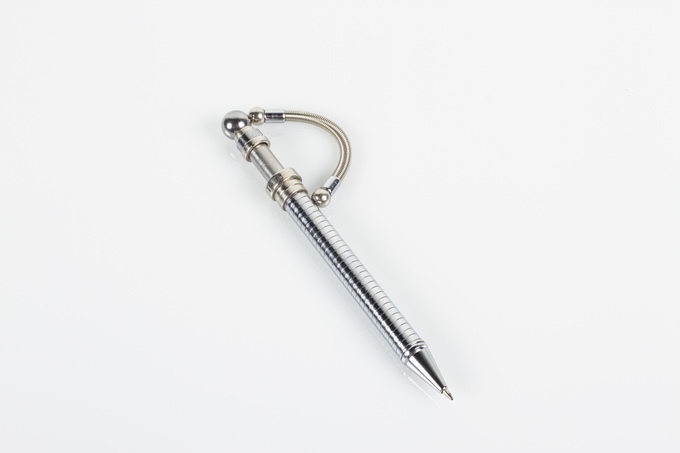 Think Ink pen is the first titanium, steel pen that bends, spins and transforms into various creative, fidgety features. For the constant fidgeters in life, we’ve created a super fun device that’s perfect for all situations, so you can discreetly fidget, whenever, wherever! Think Ink is incredibly easy to use for fidgeting and, of course, writing. You’ll finally have something to tinker with in the office or classroom without bothering those around you. The spring-like resistance of our stainless-steel flexo shaft will fill the void of any stress ball. plus,it's more useful! the invisible force of rare-earth magnets creates a floating,silent spinner that you can push and pull for additional fidget fun! SLIDEThe carbon-steel sphere has a silky-smooth rotation that discretely satisfies the pen clicker in all of us. the one-of-a-kind detachable flexo clip is an amazing standalone fidget tool with rare earth magnets that allow you to easily derach and reconnect the clip. on top of that,it's incredibly useful! clip it onto your backpack,purse,or notebook for on-the-go fun! Think Ink can do more than just satisfy the restless worker, it’s perfect for students of all ages! For the teachers who struggle with unfocused students who are in need of some extra motivation, Think Ink serves as the perfect focus tool. We even tested this product out in the classroom and found that after a few minutes of fidgeting with their Think Ink pen, students finished their work in half the time it was taking them with no focus tools at all. Meetings, brainstorms and office vibes won’t be the same with Think Ink - and we mean that in the best way possible! Think Ink pens are great for freeing up your imagination when you’ve been crammed in the office all day. Have the team tinker with them to release inspiration while relieving any stress and anxiety that’s been brought on by an overloaded inbox. So whether you’re a knee bouncer, hair twirler or pen clicker, everyone can stand to have some fun with Think Ink. Not only is there a good chance that you won’t be able to put it down, but you might just make your co-workers, colleagues or fellow classmates a little jealous.